The Paths of Yoga help us to bring awareness, balance, and harmony to each layer of our being. Over the Course of these seven months, through experiential processes and profound learnings, we will become intimate with and deepen our knowing of self vs Self. From the Knowledge that we garner, we are empowered to take responsibility for the privilege of a life we are blessed to wake up to and live on a day to day basis. By cultivating uplifting intention, and committing to compassionate action, we embrace the opportunity to live our greatest visions and ideals in a very real and possible way, unique to and authentically ours, while serving each other within the community and the greater world. First and foremost, this course is designed for anyone with a calling to dive deeper into the practices and paths of Yoga, whether the initial intention is to teach or not. We recommend having a 2+ year consistent practice, although this is not required. We recognize that TIME is not as important as our willingness NOW in this moment, to Show Up and Dive in. Secondly, this course is designed to give you a strong foundation, or fertile ground, as a yoga teacher embarking on this journey of sharing these practices with others. Whether this is your first training, or you have completed one before, it will serve as a strong anchor that will be honoring to the traditions as they have been passed down, and also help you to share the teachings in your own way with clear expression going forward. Through classical and modern approaches to yoga, this program will combine Kristen's 15+ years of yoga study of various traditions, 12+ years of full time teaching in the classroom, her Master's Degree in Spiritual Psychology, as well as including the beautiful offerings from world-renowned Guest Teachers joining our team, such as Gwyn Williams, who will be here from Bali leading our June weekend. Includes both the study of anatomy and physiology along with its relevant application to yoga practice (benefits, contraindications, healthy movement patterns, etc.). Application of Experiential Practices for Self Reflection. Living the Yamas and Niyamas in our daily life. both Application and Payments must be completed Before February 15th, 2019, unless arranged otherwise with Kristen. No refunds will be given for cancelations during the program or for an incompletion of the program, ie missed weekends without makeup. Full Refund Minus 500 chf for cancelation before February 15th, 2019 will be granted. In the event of a missed weekend, please discuss makeup requirements ahead of time. We Look forwards to Having You! Leaving the Love of the ocean and sunshine in Encinitas, CA, for the Love of her Life and his son, Kristen arrived in Basel in January 2012. In 2013, she opened Oneyoga Basel with Salome Noa and in 2016 continued on to open The Looking Glass Basel as sole owner and director. Since then, she has been striving to offer a place where everyone feels at home, welcomed, and that both teachers and students alike can Grow and Flourish. Combining over 13 years experience as a full time yoga instructor, a MA in Spiritual Psychology and coaching practice, and a Deep Love of Human Experience, Kristen's classes serve to create a safe and uplifting space, where you can be yourself, and dive into the paths of yoga at your own pace. Since April 2007, Kristen has predominantly studied the Jivamukti Yoga Method, with both the 300 hr TT under the co-founders David Life and Sharon Gannon, and the 500- hr advanced apprenticeship in NYC, under her mentor Sandhi Gayatri Ferreira. As Kristen finds being a Student the best thing ever, she also recently completed Simon Parks, Liquid Flow Teacher Training in 2017, and 30 hrs Katonah Yoga Training with Abbie Galvin in 2019. Some of her other interests of style, which influence her teachings include Katonah Yoga, Yin yoga, Iyengar yoga, Anusara yoga, playful Acroyoga, Thai Massage, and pure Bhakti Kirtan. In addition to teaching, Kristen is offering in class privates where she assists you in another teacher's class, as well as one on one, and a 250 hr Mentorship program. After graduating from the Queensland College of Oriental Medicine and beginning a clinical practice as a Zen Shiatsu therapist in the late 90’s Gwyn began exploring the integration of Traditional Thai massage. In 2002 he ventured further afield and began the first of his now annual trips to Chiang Mia, Thailand, to train under the masters. It was during one of the expeditions he discovered osteopath Arnaud Le’ Hermitte who has combining osteopathy with the art of Traditional Thai Massage. On his return he began integrating this work with his background and clinical practice as a Oriental therapist. Hence, the seed of Zenthai had been planted. Gwyn runs a range of courses and retreats varying from 2 hour workshops to 12 month programs. Some students walk away and create their own Zenthai therapy clinics, others add tools to a present practice, others bring depth and deep mindful touch to their yoga classes, others love simply sharing with family and friends. What all walk away with is a new relationship: with themself, with nature, with others – a relationship that values the present moment and allows a deeper love and acceptance for all. Gwyn has been teaching his entire adult life. Earlier as a physical education teacher, martial arts instructor and later as a yoga teacher and Zenthai facilitator. His passion for alternative therapies and connecting his heart with his hands led to him teaching Zen Shiatsu at his created Mt. Ninderry Healing Centre in 1999. Since this initial class he has become a national and international teacher of his own form of bodywork/movement and awareness. Motivated by a deep need to understand and heal diseases, Laurie received her PhD in Immunology in 2005. She further specialized in neurosciences and studied Neuroplasticity, our brain’s capability to learn and evolve lifelong. Her daily Yoga and meditation practice has considerably helped her realize that all is within, and healing can only happen in a body in harmony. This approach naturally took her toward the path of Nutrition in 2013 (Institute of Integrative Nutrition diploma, 2013), then to Biofeedback and Neurofeedback (Swiss Institute for Neurofeedback and Biofeedback diploma Institut Suisse I-NFBF, 2015). Also a teacher in Basel and Geneva Universities, Laurie particularly enjoys sharing and transmitting knowledge on a creative didactical manner. Johannes is a Yoga Teacher, Musician, Ayurveda and Thai Massage Practitioner. He is based in Germany, in the Black Forrest. 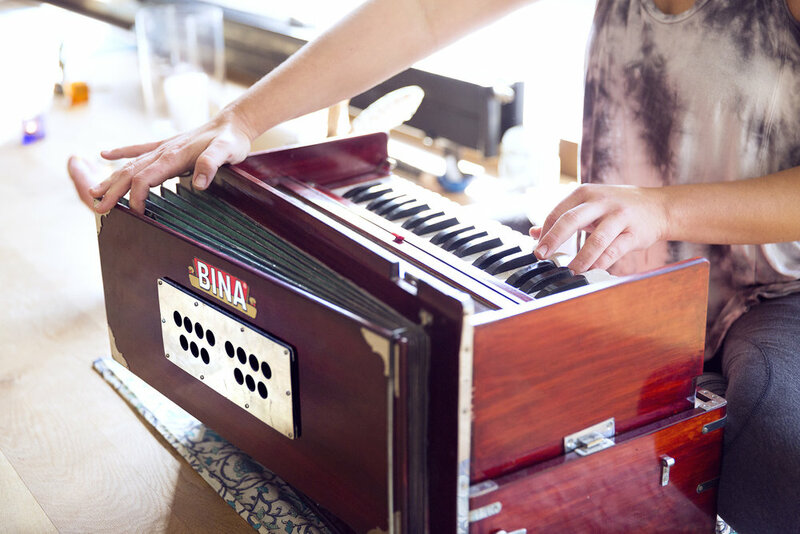 Johannes leads regular Kirtan to create sacred spaces throughout yoga classes, retreats and workshops. He loves to bring the Bhakti Aspect of Devotion and loving kindness together with music and Dharma Teachings of the Buddhist and Advaita Vedanta Traditions in an undogmatic way. He believes in the power of weaving different approaches of Yoga, Music and Bodywork together, to create a space for Healing and Joy. Johannes has travelled extensively all over the world and spent time studying with Teachers of different Traditions. 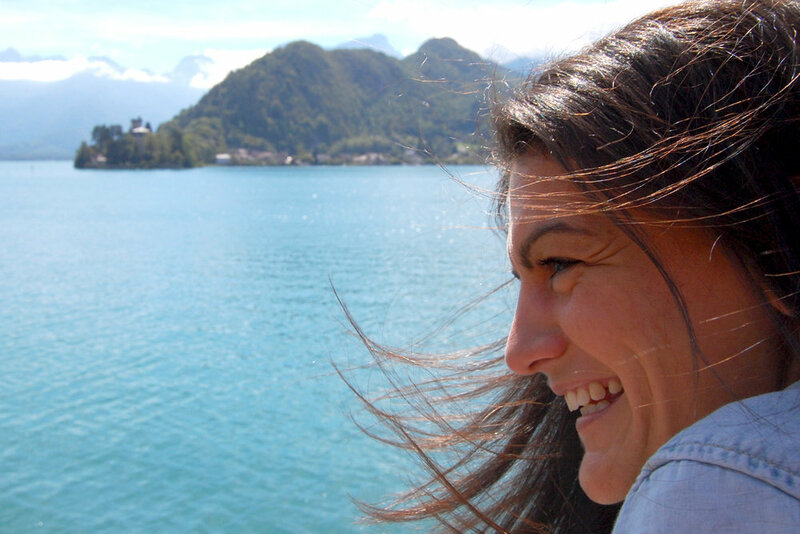 After having found her home in beautiful Basel around three years ago, Mayra has been opening more into the field of music and music therapy. Inspired from her journeys to India and the Americas, Mayra enjoys sharing spiritual music from all traditions. She has been focused on Hinduism, Yoga and Kirtan for some years now, and the change of consciousness this practice can bring about. 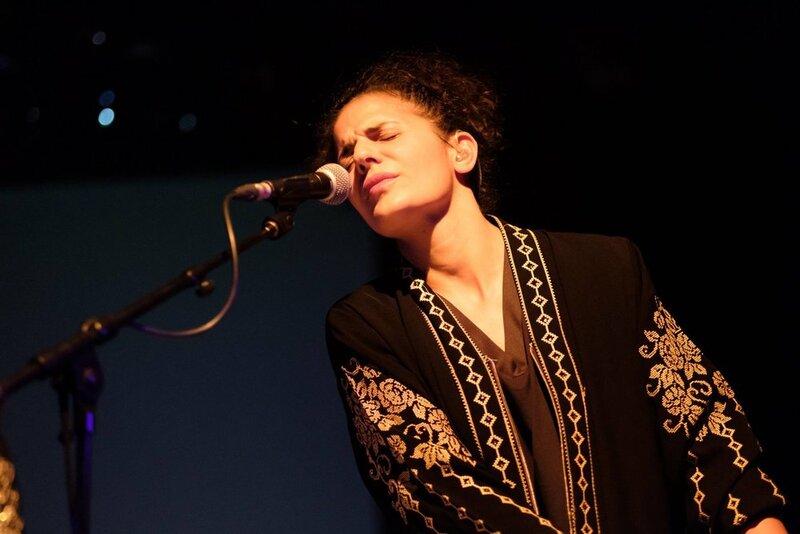 Presently Mayra is integrating her roots as a Sufi singer. Meine Ausbildung zur Gesangslehrerin habe ich am Winterthurer Institut für aktuelle Musik in den Bereichen Jazz, Pop und Rock abgeschlossen. Danach vertiefte ich mein Wissen am Complete Vocal Institut in Kopenhagen wo ich mich zur Complete Vocal Technique - Lehrerin ausbilden liess. Ich habe die Technik während meines ersten Studiums durch meine damalige Lehrerin kennengelernt und war sofort begeistert. Endlich gab es konkrete Anweisungen und wissenschaftlich fundierte Studien bezüglich des Singens. Die Begeisterung lässt nicht nach und ich freue mich mein Wissen weitergeben zu dürfen und damit jede Sängerin und jeden Sänger individuell zu unterstützen. Der zweite Schwerpunkt meines Unterrichts ist die Musikalität. Von Interpretation über Improvisation bis hin zum Songwriting soll alles Platz haben. So versuche ich mit den SängerInnen die Aspekte des Gesangs von verschiedenen Seiten zu beleuchten und ihnen neue Inputs zu geben. Wichtig dabei ist mir eine entspannte und herzliche Atmosphäre zu schaffen, damit sich die Sänger und Sängerinnen wohl fühlen und ihrer Stimme Raum geben können. SING OUT LOUD! Musikalisch unterwegs bin ich hauptsächlich mit meiner Band The RK.